Make sure you choose a clean, flat work surface. You will also want to clean your decor before you cover it with the contact paper. If dirt and other debris get trapped under the paper, the specks will cause bumps to form. 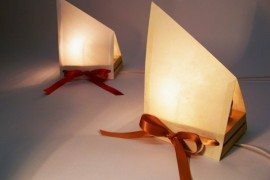 It also helps to have a credit card or plastic gift card on hand to run over the surface of the contact paper once you’ve applied it to your decor of choice. This helps to smooth the paper and achieve a seamless finish! 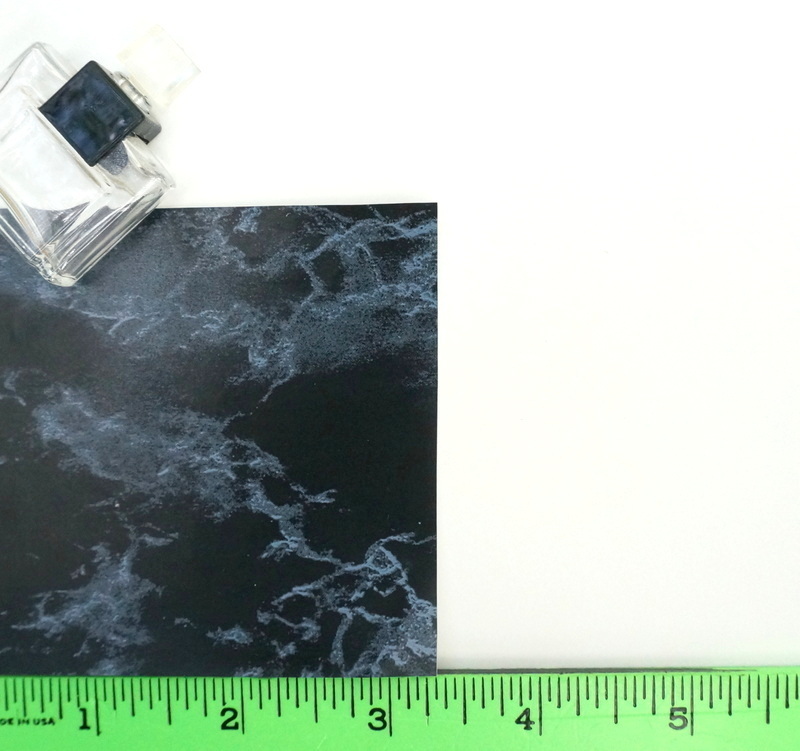 Marble contact paper can be found in a variety of locations, from home improvement and hardware stores to online retailers. 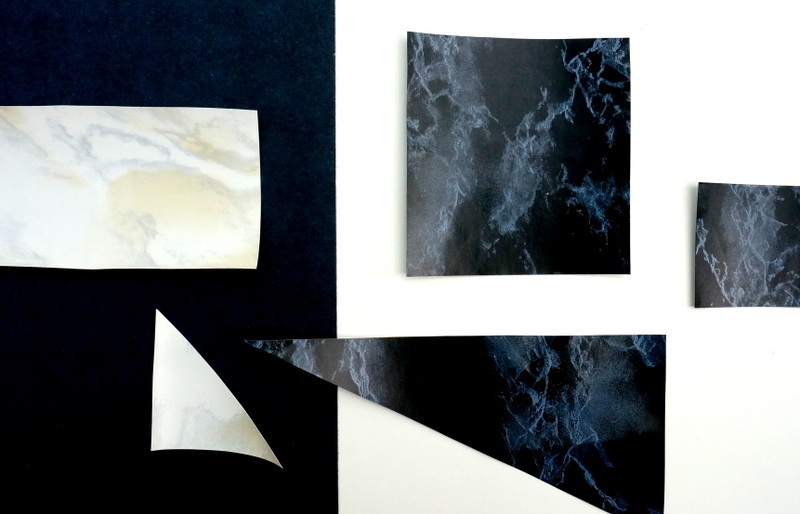 For today’s project, I used marble contact paper in shades of black and white. 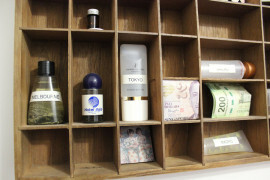 Do you collect vintage perfume bottles? 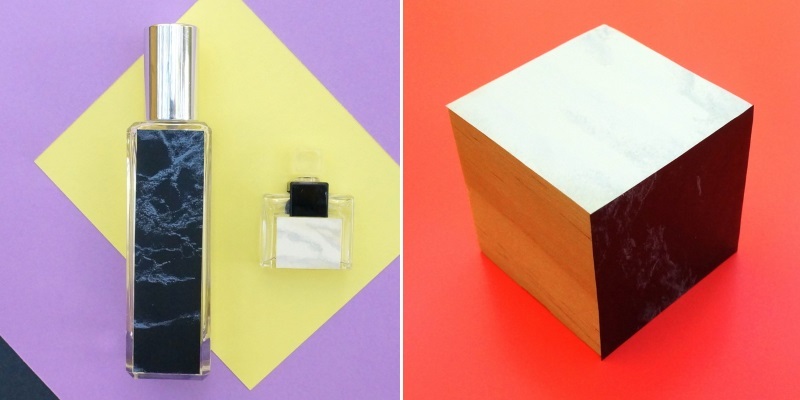 Or perhaps you have new bottles of perfume that you’d like to enhance. 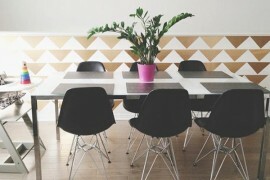 Give them a modern touch by adding marble contact paper to the surface. For this project (and all of today’s featured projects, for that matter), careful measuring is essential. Use a ruler to measure the area you’d like to cover. When you flip over your contact paper, it should have a grid drawn on the back. This will help you draw the exact shape you need. Mark the length and width of the surface you will be covering, then connect the dots with a ruler. 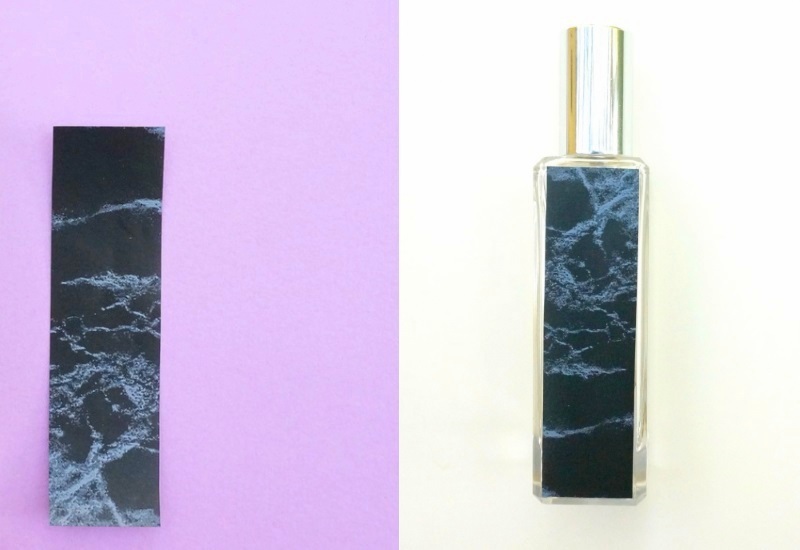 Cut out your marble shape, remove the peel-away backing and apply the contact paper to your perfume bottle. 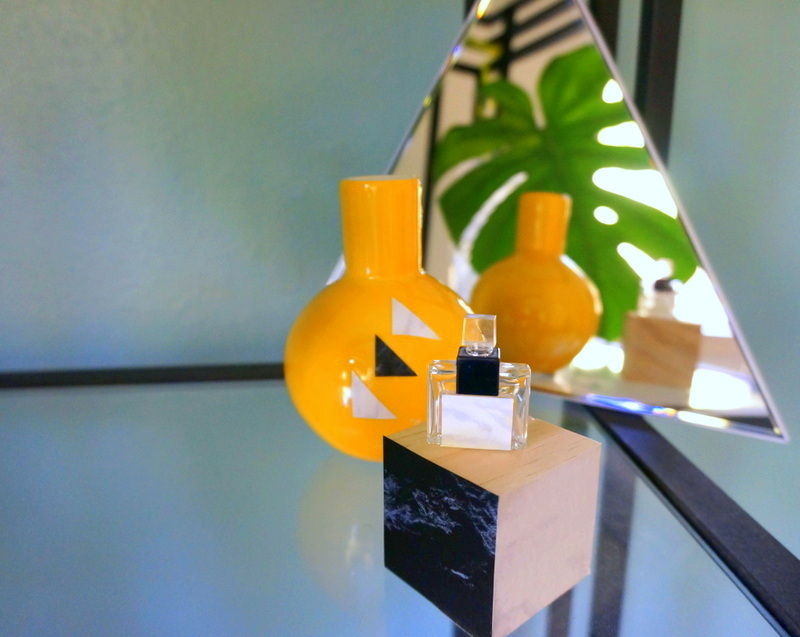 I love the way a simple rectangle of marble contact paper transformed the perfume bottles below into trendy modern accents for the vanity. 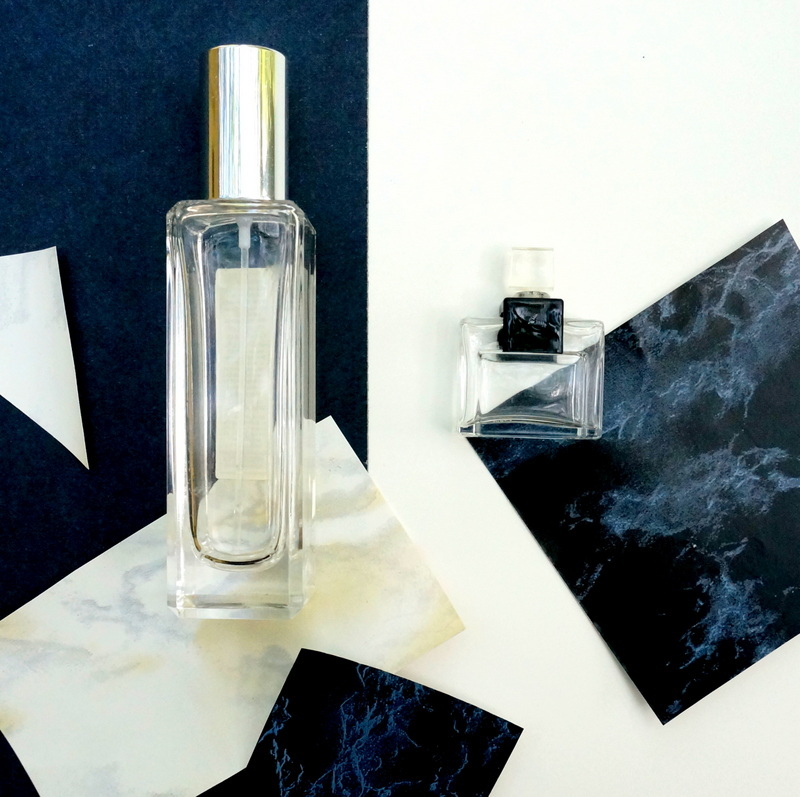 Plus, the contrast between the black marble paper and the white marble paper creates an interesting dynamic, don’t you think?! Geo style–it’s everywhere you look! Geometric forms can be found on surfaces that range from bedding and pillows to rugs and upholstery. Yet high-end modern design studios are also reveling in geometric objects, combining materials such as marble, metal and wood for a celebration of texture and form. 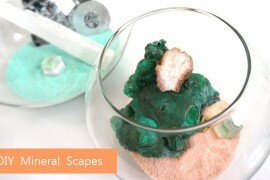 Why not make your own geo form to use in a vignette or a mini still life arrangement on a tabletop or shelf?! 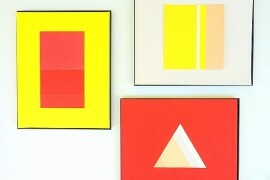 Wooden geometric shapes can be purchased at your local craft store at very affordable prices. 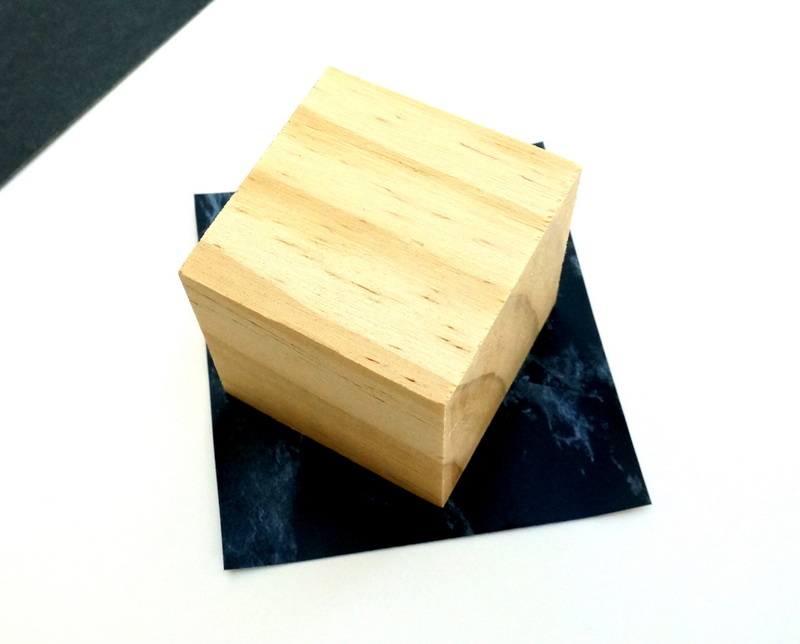 I chose a cube for this project. 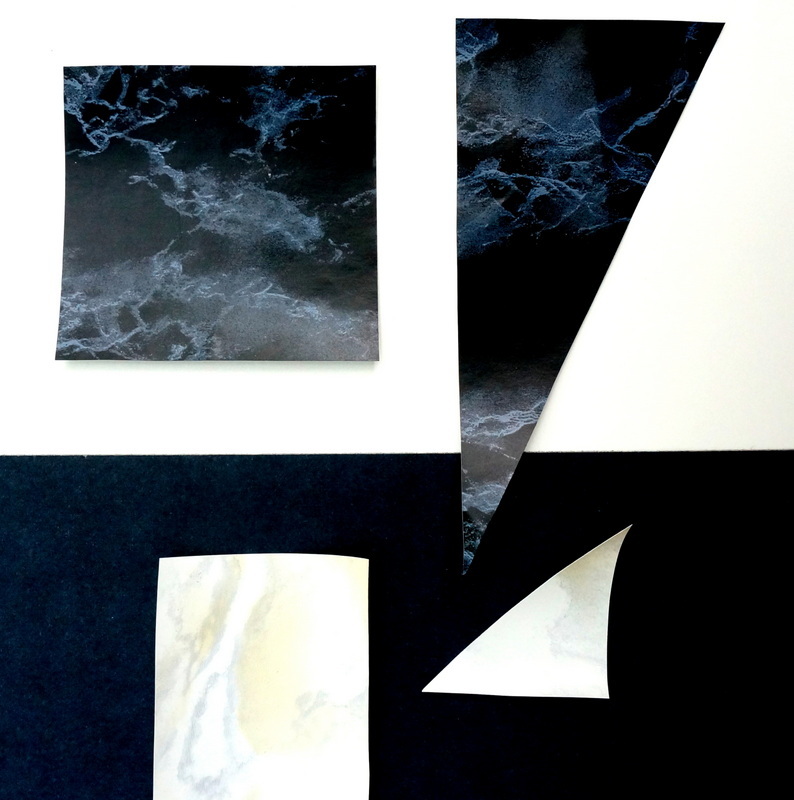 To create your own marble geo object, simply trace the form onto your contact paper, cut out the resulting shape, remove the peel-away backing and stick! Repeat the process until you’ve covered the desired number of sides on your geo form. 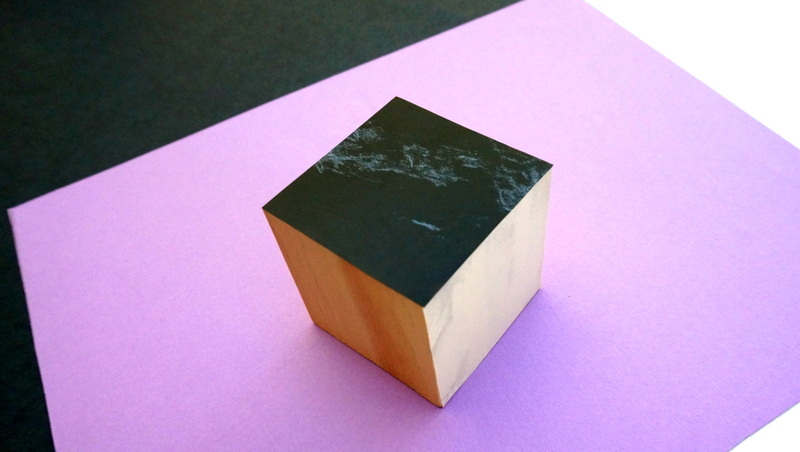 Although the lighting makes it a bit tricky to tell, the cube below features a combination of black and white marble contact paper. Not to mention, some sides were left bare so the texture of the wood could shine as well! 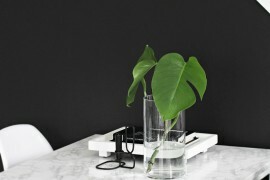 Once it’s complete, your geo form can be displayed as is, or you can make more than one and combine them with other small decor to create a sculptural vignette! Today’s last featured project doesn’t get much simpler! 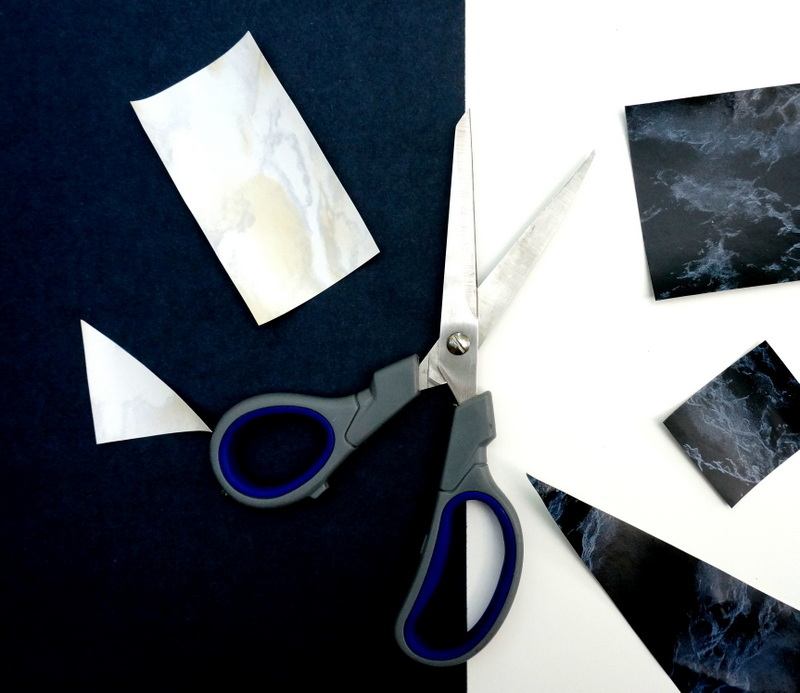 Simply cut out a few marble contact paper triangles, remove the peel-away backing, and stick the triangles to the vase of your choice. 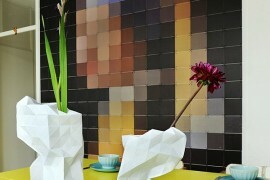 While any vase will work, colorful pieces create a bold contrast with the black and white contact paper. Also note that sticking contact paper to a rounded surface can be tricky, so it helps if the contact paper shapes are on the small side. Here’s another look at all three of today’s project ideas! 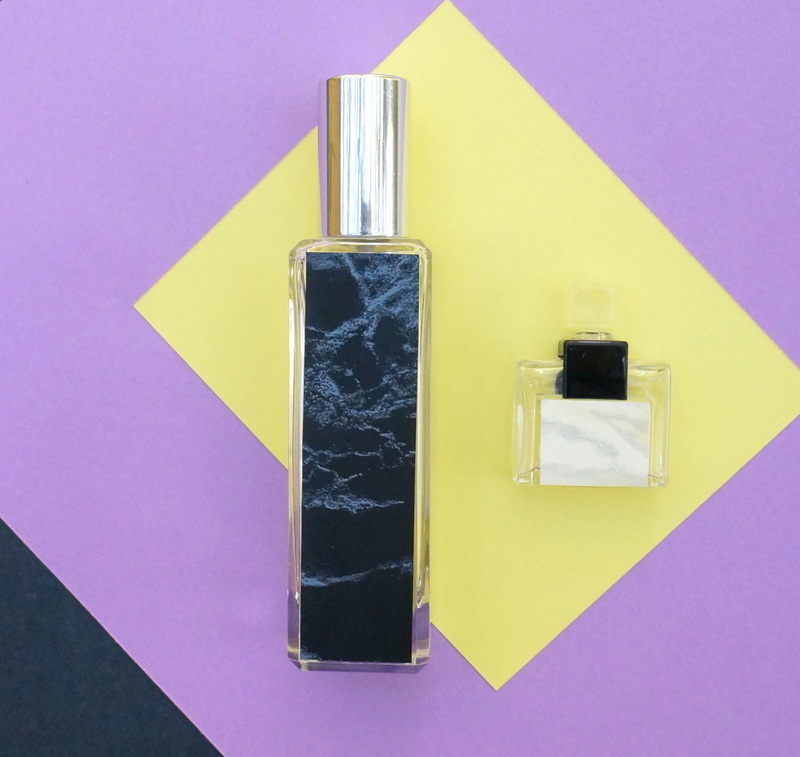 The vase and perfume bottle would make great gift ideas, while the marble cube is the perfect way to add a bit of artistry to your home. 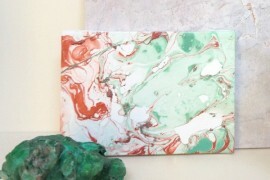 Try combining it with rocks, minerals, marble tiles or small metal objects for a look that is very on-trend!